Malay food can be healthy. One of my favourite lunches when eating out used to be from the Malay rice stall where I choose only vegetable curries, a slice of fish and this delicious dish, sambal goreng. For those who do not know, this is mostly green beans, soya bean cake, tempeh (a fermented soya bean cake) and perhaps prawns, fried in a chilli paste. I generally avoid meat dishes because of the saturated fat found in them, ask for less rice and I am set. I may have perhaps fruit for some fresh crunch at the end. And long after those days, I still cook sambal goreng whenever I can. It is protein-rich due to the beans and soya bean products found in it. I make it healthier by omitting the coconut milk found in some recipes. Nutritionally, there are many reasons to recommend the soya bean. While much literature can be found on these benefits, they can be summed up this way: it is rich in protein, vitamins, minerals and insoluble fibre. Asians are luckier in this respect because we can consume soya beans in many forms. I also use the sweeter sugar snaps rather than the usual long beans or French beans, so the amount of added sugar can be reduced. • To make the spice paste, place all the ingredients into an electric chopper and process till fine. • Divide the paste into desired amounts, store in glass jars and freeze, if needed. • Heat 2 tbs of vegetable oil in a pan and, when it gets hot, brown the tau kwa and tempeh pieces in the pan. Remove and drain on kitchen paper. • Heat another 1 tbs of oil in the pan and saute 2 tbs of the fresh or bottled spice paste. • Add the sugar snaps and edamame beans to the pan, followed by the fish cake. • Finally, return the tau kwa and the tempeh to the pan. • If using the fresh spice paste, season with 1 tsp salt (and ½ tsp sugar, if desired). • Toss to mix before serving. Finally, I substitute fish cake for the prawns to cut down on the dietary cholesterol content in the dish. And if I cannot be bothered to make the fresh spice paste or rempah for it, I resort to my reliable standby, bottled sambal chilli. This is just chilli, onions and shrimp paste, available under many brands. I like Singlong or Glory. But you can also make up a batch and freeze it for use whenever you need it. Despite the spicy, oily character of Malay food, many dishes are also boiled and you can cut down on the oil used for frying and rely on healthy monounsaturated oils such as canola, peanut or olive oil. Nutritionally, there are many reasons to recommend the soya bean. While much literature can be found on these benefits, they can be summed up this way: Soya bean is rich in protein, vitamins, minerals and insoluble fibre. Asians are even luckier in this respect because we can consume soya beans in so many forms. These include tofu and taukwa (firm soya bean cake), a fermented paste as in miso and taucheo, and tempeh, a cake of fermented soya beans. They all deliver rich proteins to the diet and complete proteins at that. They contain all nine essential amino acids found primarily in meat, fish, poultry and eggs, as well as some interesting phytochemicals such as isoflavones and saponins. Indeed, the soya bean contains a wealth of nutrients and phytochemicals that are tied to an impressive array of medical benefits. These include decreasing the symptoms of menopause, lowering the risks of certain types of cancer, reducing cholesterol and building stronger bones. Two kinds of soya beans bear some closer inspection. 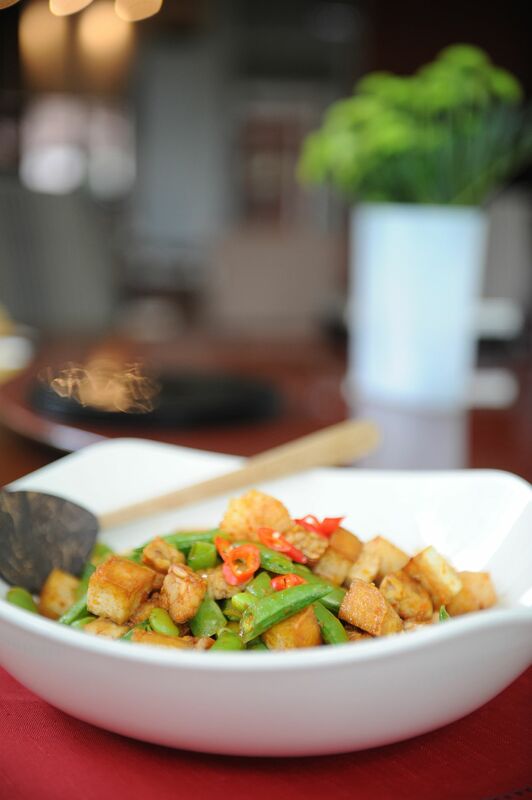 Tempeh has gone through the process of fermentation, which makes the soya beans more digestible and softer, as enzymes produced by the mould pre-digests a large portion of the basic nutrients. The other is fresh edamame beans or young green soya beans, not found in the traditional recipe, but are sweet and nutty. Other nutrients aside, they are also a rich source of the B-complex vitamins folate, niacin, riboflavin and thiamine, and vitamins C and K, as well as the minerals calcium, phosphorus and potassium. But I never think of these things when I decide to cook this dish. I think of the lovely taste of sambal in my mouth, how delicious it is and how healthy. •Sylvia Tan is a freelance writer and cookbook author. Her previous Eat To Live recipes can be found in two cookbooks, Eat To Live and Taste. Soya protein is a healthier option than animal protein as it has less fat - namely, saturated fat. Plus, it does not have cholesterol. Also, soya contains healthy fats, such as polyunsaturated omega-3 and isoflavone, which are believed to be beneficial for your health. However, animal protein has all the essential amino acids crucial for bodily functions, whereas at least one amino acid is absent in plant-based protein. Even so, studies now show that eating a variety of plant-based proteins throughout the day - such as tofu, tempeh, lentils, nuts and seeds - should provide all the essential amino acids you need. Eating soya has been found to ease menopause symptoms, reduce the risk of cancer, lower cholesterol levels and build strong bones. All soya products are good for you because of the isoflavone content. But different soya sources give you different amounts of nutrients. For example, tempeh is more dense in nutrients than tau kwa, which in turn packs more nutrients than tau huay. The preparation method matters too. Tempeh is often deep-fried, and eaten with sauces that are high in sugar or fat, making it less healthy. When tempeh is prepared using healthier cooking methods, it is a great source of lean protein.